We are continuing downstream along the River Seine beside the Ile de la Cite. On the Left Bank just past Petit Pont is the Pont Saint Michel. We can see the spire of Saint Michel's Chapel behind the Palace de Justice in the photo. The bridge is a three span stone masonry filled spandrel arch bridge. It is 62 m (204 ft) long and 30 m (98.5 ft) wide. It was built during the reign of Napoleon III in 1857 and bears his insignia above the round cutwaters on the piers. 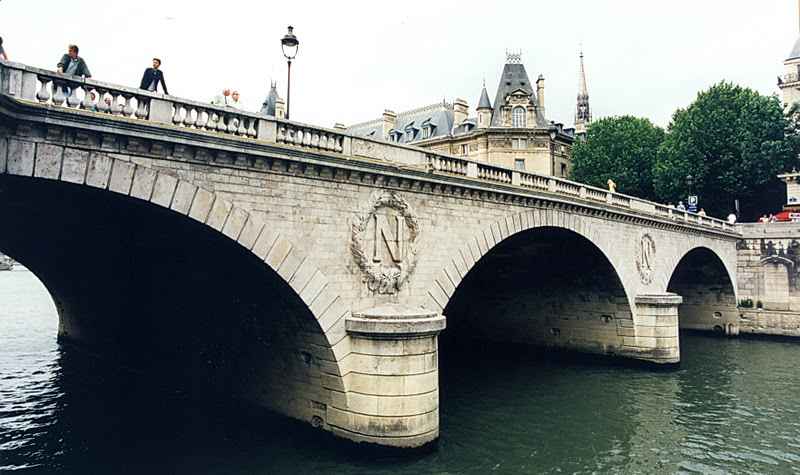 In 1961, during a peaceful demonstration against the French occupation of Algeria, the protestors were attacked by the police and hundreds were killed, many thrown unconscious from this bridge into the Seine. Seine River Bridges: Pont Saint Michel by Mark Yashinsky is licensed under a Creative Commons Attribution-NonCommercial-ShareAlike 3.0 United States License.